Finding bulk headphones is much different than finding headphones for an individual. This is because the criteria and requirements are much different when purchasing on a larger scale. Do you work in a business and have a need bulk headphones for your company, business conference or corporation? Maybe you help places like hospitals, gyms, hotels find and source products but you need to get the best quality and pricing for your customers. If you do, you already know and understand some of the challenges you may encounter when it comes to finding the right solution and company to work with. 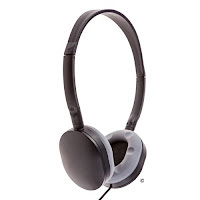 First Class Headphones has a number of bulk headphones that are popular in companies around the world. This is because they deliver a comfortable fit and stereo sound at an affordable price. One of the biggest benefits of buying headphones in bulk is that the more you buy, the more money that you can save money. They are focused on saving you time, money and providing a superior customer experience that others do not offer. Most of the bulk headphones that are available come with a standard 3.5mm plug adapter which is compatible with any device that is equipped with a standard headphone jack. This will help to ensure that they will be compatible and work on the device for the intended use. One example is bulk headphones for hospitals, they can be used by a number of different people from hospital staff and for patients and visitors. Most of the devices that the headphones will be connected to in these environments will have a standard headphone jack which makes it easy and hassle free to connect. This is important when it comes to creating a more relaxed visit or experience. There are a number of other verticals that can benefit from getting bulk headphones. If you run a gym, maybe you have considered getting headphones that members can purchase if they have forgot or misplaced their own set. Offering this as a solution in a gym or fitness facility can make it easier for members to enjoy their workout even if they don't have working headphones with them. Motels and Hotels can also use bulk headphones to give their guests another convenience if the need arises. In the hospitality industry, we understand that it is important to consider the potential for these kinds of needs and also be able to fill the need to provide the best experience possible so they keep coming back in the future. Another example is at museums where there are often exhibits that have interactive audio. Bulk headphones can help bring the cost down while providing visitors with the convenience of bulk earbuds or headphones for interactive exhibits. Earbuds can take up less space but headphones deliver a more traditional fit so it is important to consider what kind of applications the intended users will be using them and perhaps the storage space you will need for them. Once you have made your decision, you may be able to obtain a sample or trial pair from First Class Headphones. This can go a long way to helping make sure they will meet all of your requirements and needs prior to making a large purchase. We hope you found this information helpful when you consider buying bulk headphones. If you did, please consider sharing it on your favorite social network. First Class Headphones accepts purchase orders and their team is focused on provide real solutions for real businesses with unique requirements.